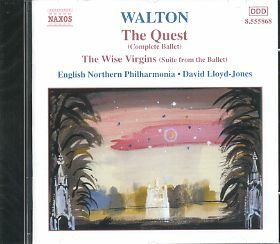 Like Thomson, Lloyd-Jones couples The Quest with the suite from a ballet that Walton wrote earlier in the war, The Wise Virgins, orchestrating movements from Bach cantatas, including Sheep may Safely Graze. Again Lloyd-Jones’s performance, at faster speeds, more effectively brings out the sharpness of orchestration which, so far from being inflated, gives off electric sparks. The brief interlude fro strings, Siesta,one of Walton’s earliest orchestral pieces, makes an attractive supplement.